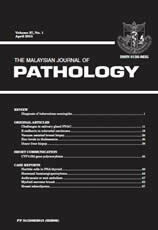 Thank you for submitting your manuscript to the Malaysian Journal of Pathology . Please read our Information for Authors and format your manuscript as specified. Use the form below to submit your manuscript. If you have questions, please contact the Editors via e-mail at Editor of mjpath.org.my. Please note, this form is for submitting manuscripts only. Consult our Information for Authors for information on submitting resources and and letters to the editor. Indicate the section of the Journal in which you feel the manuscript would be most appropriate. The Information for Authors provides a description of the journal sections. Use the text field below to enter keywords to fully describe your manuscript. Separate these by a comma. This information will be used to help select reviewers and index your manuscript once published. The intent is to ensure complete disclosure of conflicts of interest or relationships that could potentially be construed to be a conflict of interest. If you are in any doubt as to whether a source of funding, other benefit or relationship could be interpreted as a conflict of interest concerning the material contained in the manuscript you are submitting, err on the side of disclosure. Disclosure of potential conflicts of interest protects the integrity of both your manuscript and the Journal. In most cases properly disclosed conflicts of interest will not preclude acceptance of a manuscript for publication decision. "A conflict of interest exists when an author ’s financial interests or other opportunities for tangible personal benefit may compromise, or reasonably appear to compromise, the independence of judgment in the research or scholarship presented in the manuscript submission." I have disclosed a relationship(s), financial or other that could potentially be construed to affect the material contained in the manuscript that is being submitted to the Journal. Note: This form-based submission system will accept manuscripts up to four megabytes in size. If you manuscript is larger than this, please contact the editor via the e-mail address above. Press the submit button below to submit your manuscript.